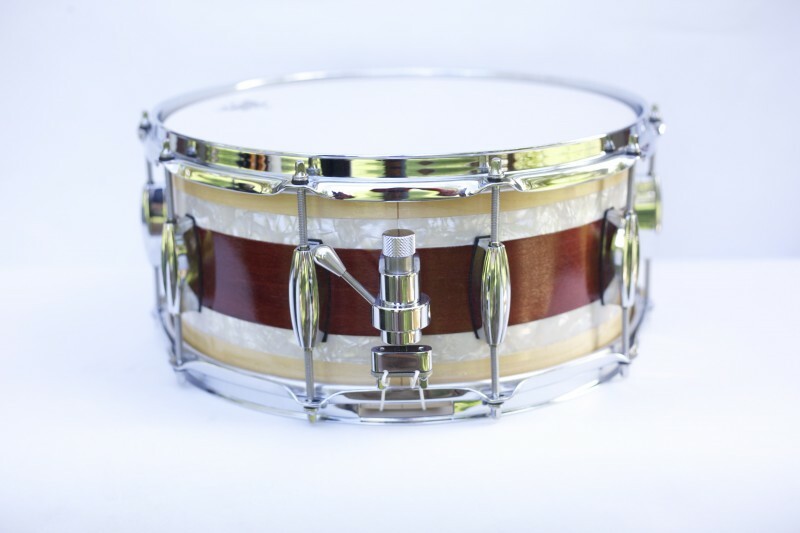 Hey this is Philip Ellis, and I’m going to show you the Trick GS007 Snare Strainer. What I like about this snare strainer is the fluid motion to turn it on and off. Also this is the Multi-Step, so it stops at 3 separate positions. I think this is the best strainer on the market right now, and that’s why we put them on P.Ellis Drums. I will demonstrate a little of how this works: Open sound, Loose sound, (hitting drums) and you got your full on snare wire engagement. Also when you are turning the snare tension knob, there are different points at where the snare knob stops. I use the s-10 strainer which is alot like the Ludwig p-85 I believe, and the problem with those types of snare strainers are that the snare knob (where you adjust the snare wire tension) can vibrate loose after you’ve been playing it for a while, especially if your hitting rim shots most of the time. There are some solutions to this problem, but I think that Trick came up with a great solution. They added ball bearings that have a stopping point for every little bit of a turn. So that is the Trick GS007 Multi-Step Snare Strainer Review and you can learn more about at www.trickdrums.com.